Here are some general knowledge facts about the Bermuda triangle. 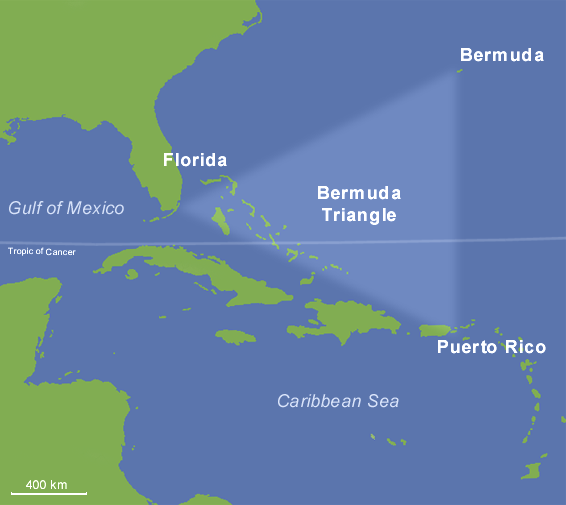 Many theories have been put forward to explain the mystery relating to Bermuda Triangle which include both natural as well as supernatural. Natural explanations include compass variations , violent weather,human error,presence of large fields of Methane Hydrates etc. whereas the supernatural explanations are those like the lost continent of Atlantis(more),presence of UFOs ,etc. Larry Kusche a research librarian from the Arizona university researched about the topic and concluded in 1975 that the number of ships reportedly missing in the area was not higher compared to other regions in the ocean and also said that the Bermuda Triangle was a planted mystery . The US navvy has not yet recognized the triangle ,according to them it does not exist .The Bermuda Triangle was not included in the list of 10 most dangerous waters for shipping created by the WWF.